Sometime emails are only spam and sometimes they are like Christmas presents. 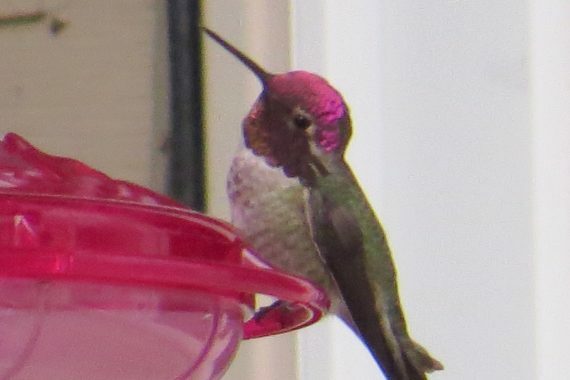 On Friday, Ross received an email about a second-hand report of an unusual hummingbird coming to a feeder just south of Fremont in Saunders County. Fortunately, the email included some decent, albeit fuzzy, photos of bird. This time around the report turned out to be a notable and nice surprise – an adult male Anna’s Hummingbird. The homeowner, while enthusiastic about the sighting, had some reservations about visitors. After some initial contacts, Mark and Ed Brogie and I were given permission by the homeowner to access the backyard to see the bird late Saturday afternoon. After waiting only about fifteen minutes, the little gem came in and sat in a crab apple tree and it then visited the feeder. In addition to the photo above, below are two more photos and a brief video. This will be Nebraska’s second record of an Anna’s Hummingbird. The first record occurred less than two years ago in late 2016 when an sub-adult female appeared at the Manning’s feeder in Omaha. More details about this record can be found on the Anna’s Hummingbird species account. Anna’s Hummingbird has become increasingly prone to wandering away from its primary range along the West Coast and Southwest and records are now littered across most eastern states (see the map from eBird.org, below). Adult males are unusual but do occur on occasion with previous Midwest and Great Plains records coming from Michigan, Ontario, Wisconsin (2) and Missouri. Nebraska will likely have more records of Anna’s Hummingbird in the future, especially as observers increasingly scrutinize late season hummingbirds. The Anna’s Hummingbird was reported as recently as Monday, October 9th. 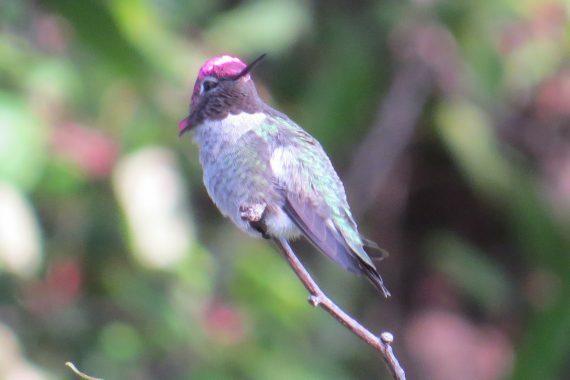 We’ve updated the Anna’s Hummingbird species account to include this recent record. We will finalize a departure or end date once once it become certain.